A small Marine task force operating out of one of Afghanistan’s bloodiest provinces saw no combat action during its deployment despite a high operational tempo and busy deployment cycle. 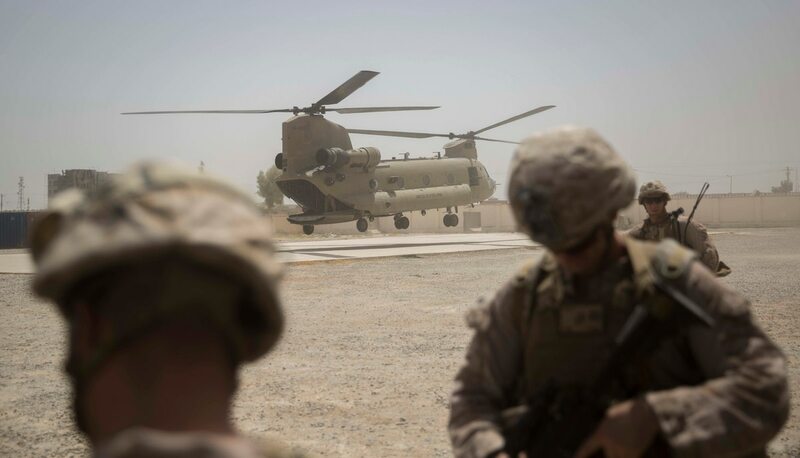 Nearly 300 Marines with Task Force Southwest deployed to the sparsely populated Helmand province, one of the most unstable areas in the country, late spring. The Combat Action Ribbon is one of the most coveted and controversial awards in the Marine Corps. Marines and veterans alike have been ridiculed by other veterans, especially those who hail from the combat occupations, due to a lack of Combat Action Ribbons. The growing discord surrounding Combat Action Ribbons — the award issued by the sea services for active participation in ground or surface combat — is troubling some leaders. But the ribbon also is a metric of the number of combat experienced Marines still operating in the Corps today. As the wars in Afghanistan in Iraq began to wane for conventional Marine forces, thousands have left the Corps. The drain of combat experienced Marines has resulted in a drop of more than half in the number of active-duty Marines with a Combat Action Ribbon, a report from Marine Corps Times found. The rapid drawdowns in Iraq and Afghanistan have limited the number of combat deployments for conventional Marines. But even with recent deployments to Afghanistan, Marines are filing in advisory roles with the job to help train and equip partner forces, not engage in combat operations. Though the Marines have not been kicking in doors and engaging Taliban militants directly on the battlefield, their presence this deployment cycle has paid major dividends and helped rebuild a more capable and deadly Afghan security force in Helmand. Just a year ago, Afghan forces in Helmand were on the verge of disintegration. Racked with corruption and phony troop rosters known as “Ghost Soldiers,” the Taliban were on the verge of overrunning all of Helmand province. Lashkar Gah, the province’s provincial capital, has nearly collapsed to Taliban militants several times. Afghanistan’s 215th Corps based out of Camp Shorab, formerly known as Camp Bastion and Leatherneck during the height of the U.S. and U.K. participation in the Afghan war, has undergone considerable restructuring, and with the Marine advisers this year it is back on the offensive. Early this summer, Afghan forces and Marine partners retook Nawa, a strategic district located just a stone’s throw from Lashkar Gah and home to an important airfield known as Bost airport. The airfield recently began operations for the first time in several years. The Marines also have aided Afghan counterparts in offensive operations in Sangin, Gereshk, and most recently Marjah ― former hallowed battlefields of Marines not long ago. The Marines recently beefed up lethality by bringing in the the M142 High Mobility Artillery Rocket System, or HIMARS system, which as of late, has been targeting Taliban narcotics operations and destroying the militant group’s revenue streams. The Corps is facing a drain of battle-tested Marines. Marines have been building new capabilities for Afghan security forces in the region that will aid in sustaining the force and bolstering the force’s lethality. The Marines out at Shorab embedded with Afghan partners have introduced casualty evacuation training, which has reduced the time it takes to move injured Afghan forces off the battlefield. The Marines have also expanded and trained new Afghan air controllers capable of calling in precision airstrikes for maneuvering Afghan ground forces. “Our success enabling the Afghans, especially with operations and intelligence warfighting functions, was solely due to the individual performance of the task force’s staff and advisers,” Turner said. Despite not engaging in direct combat with the enemy, Marines with Task Force Southwest are still bringing back important downrange skill sets that will help the Corps to continue to foster capable and competent leaders.